Article from Ballina Shire Advocate Thursday 17th May 2012. A FREE seminar on franchising will be held in Ballina on May 22. The seminar is being presented by Brian Keen, from How to Franchise Simply. Brian started and grew six new franchise businesses with over 120 outlets over a five-year period. Over the last three decades he has also helped dozens of businesses franchise successfully, increasing their profits and allowing their owners to work fewer hours and get their lives back. He’ll be sharing his knowledge with participants, as well as passing on some invaluable tips and opportunities. “Franchising is an exciting and fertile area for business that continues to grow at around 12%,” he said. The seminar will be held at the Ballina Beach Resort, Compton Dr, East Ballina, from 6pm. For free tickets, go to www.howtofranchiseseminars.com. 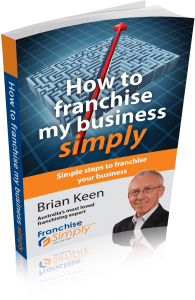 For more information, email brian@howtofranchisesimply.com.au or phone 0417 211 366.